The bottom line with multiple monitors is about fundamental productivity gains. When you spread a desktop across two or more screens, you can see more, toggle windows less, make clearer decisions, and accomplish more work in less time. 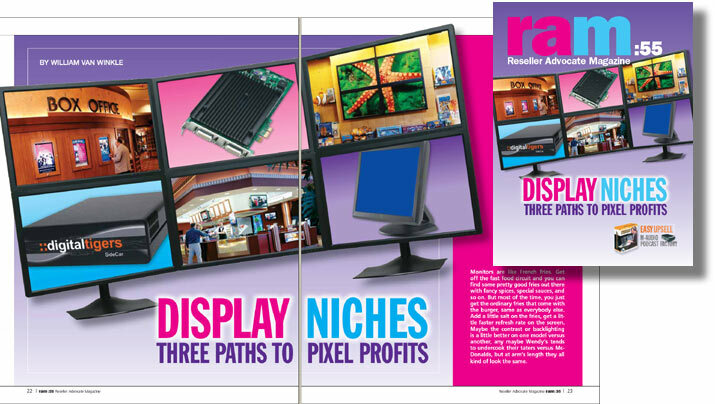 The Digital Tigers Zenview Command Center Elite six-screen display is featured on the cover of the June issue of Reseller Advocate, the leading independent trade magazine for high-tech resellers. The following is an excerpt from the cover story. Subheads have been added to organize this excerpt. For full article and issue, see Reseller Advocate #55 (8MB PDF), p.22. on,” noted one Microsoft researcher. Investigators were also surprised to find that women achieve greater spatial recognition and navigation improvement than men from a larger display field. Jon Peddie Research also polled several thousand people on many aspects of multi-monitor adoption and usage. NEC Display, seemingly the much-needed innovator in the business display world, did offer us one case study regarding Software Spectrum, a multi-national IT services provider. Software Spectrum outfitted 500 employees worldwide with dual-monitor setups. Customer service reps immediately reported a minimization in scrolling, navigation, and printing necessary in order to view pertinent customer information. Customer hold times went down, as did printing costs, productivity went up, and there was no negative impact on labor costs. NEC’s case study also notes that Forbes.com experienced a 50% drop in editorial production times among copy editors who adopted dual monitors. Irresistible, right? Every customer should want one...or two or three. You would think so. But the question is: Why is there so little multi-monitor demand? “There’s a whole lot of ignorance and stupidity going on with regard to multiple monitors,” says Geoff Amthor, president of Digital Tigers, one of the leading manufacturers of multi-monitor solutions. “Anyone who’s ever used multiple monitors will never go back. It’s like you walked in and your IQ jumped 20 points. What you can conceive in your mind you can now see better, and you’re not so much like a dog chasing its tail jumping around from place to place. Seventy percent of users perhaps should be using multiple monitors, but, according to Peddie’s study, only 32% of users polled actually do. (That number rises to 41% among road warriors.) Moreover, Peddie estimates that less than 3 million currently operational systems, or under 3% of all systems in use, are equipped with multiple monitors. Those two sets of statistics may seem to conflict, but remember that, among other factors, a user might have four or five PCs but only outfit one of them with multiple displays. Traditionally, the leading market for multi-monitor deployment is financial traders, who strive to make money on the information they can see and assess at once. The little bit more data a trader takes in could make a $10,000 difference in just one day. This is why the finance sector hardly blinks at the added expense of going multi-monitor. To sink its hooks even further into this primary multi-monitor market, NVIDIA did some fancy tweaking and enabled user profiles within the display drivers. So a trader can walk up to any eight-monitor desk, for example, log in as himself, and his applications and desktop arrangement will come up exactly the same way regardless of their location. If you’re dealing with three, four, five displays, you don’t want to have to rearrange and reconfigure everything each time you switch offices and log in. 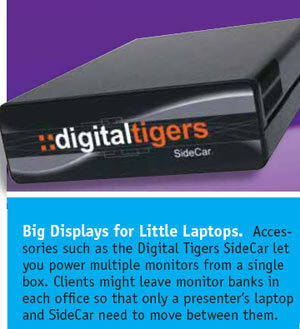 Digital Tigers focuses all of its product families on multi-monitor systems. Most notable is the company’s Zenview line of multi-screen displays, running from the two-screen Zenview Duo 17X (twin 17” LCDs; $899) up through the Zenview Arena Ultra HD ($7,499), comprised of a 30” main panel flanked by two 20.1” LCDs in portrait orientation all topped by three landscape 20.1” screens. The hottest seller, according to Amthor, is the Zenview Trio 19S ($1,799), a triptych of 1280 x 1024 (SXGA) 19” screens mounted on one stand. 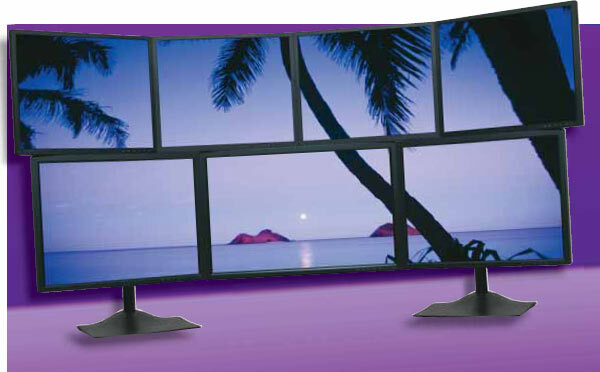 Digital Tigers uses Samsung for all of its displays, although the 19S uses the highest spec parts, featuring a 1000:1 contrast ratio and 178degree viewing angle. Within the product line, you’ll find some interesting value points. For example, there’s a $600 spread between the Zenview Trio 20S (three 20.1” screens) and the 21S (three 21.3” screens), even though the resolution between the two SKUs, and thus the amount of information that can be displayed, is identical. One thing that differentiates multi-monitor vendors is the refinement of their software. Multiple monitor support in Windows is present but rudimentary. NVIDIA gives us a better sense of refinement with its Quadro NVS drivers. But Digital Tigers and its Zenview Manager title (free with displays; $75 separately) show how multi-monitor should be done. As you know, if you run more than six or seven apps at once, their taskbar buttons start to condense so much that you can no longer tell what each button represents. Zenview Manager creates a separate taskbar for each monitor. You can not only assign applications to open on a specific monitor but resize, position them precisely, and save the arrangement for reuse on each new system startup. There are plenty of other, smaller features, but one of our favorites is the ability to span a wallpaper across all screens rather than the usual Windows approach of cloning the same shot to every panel. Another of our favorites in the Digital Tigers lineup is the SideCar series. SideCars are PCMCIA-based boxes (ExpressCard is coming soon) housing NVIDIA- or Matrox-based display adapters. Different models allow for up to four monitors to link into the SideCar. Add in the laptop’s own screen and you now have a five-screen display system. For presenters who want to run multi-monitor setups in different locations, SideCars are an easy way to leave bulky monitors at the various sites and only haul one notebook around to power all of them in turn. that he firmly advocates a 512MB video card for powering a triple- or quad-display array. Geoff Amthor takes a broader, system-wide approach. He cites a minimum of 2GB of system RAM, 256MB on the graphics card, and dual processing, whether that’s dual-core or dual-CPU. In fact, if you want to start selling multi-monitor into larger accounts, you’d do well to study and/or resell Digital Tigers’ line of Stratosphere display workstations. Currently, the flagship of this family is the Hyperion, a dual Opteron beast founded on an nForce Pro motherboard, NVIDIA GeForce or Quadro graphics, at least 2GB of memory, twin 500W silent power supplies, and a 1,500VA TrippLite UPS. Amthor notes that inclusion of a voltage-regulating UPS is now standard on all models, and since implementing this step Digital Tigers has not had a single power-related support issue. The company is also obsessive about reducing noise output, knowing that users willing to pay several thousand dollars on a display system are also likely to not want system noise disturbing their concentration. Digital Tigers even goes so far as to import a special Xeon CPU heatsink from Europe that is not available anywhere else in the States. Also noteworthy is that Digital Tigers negotiated a zero dead pixel warranty policy from Samsung, which supplies all of the company’s panels. Digital Tigers is able to pass this policy along to resellers. Such measures are what make the difference between an exceptional multi-monitor solution and a passable one. In the end, though, don’t underestimate the power of a passable multi-monitor solution for those with modest needs. To anyone who has never moved beyond the single-screen paradigm, going multiple is like achieving enlightenment. 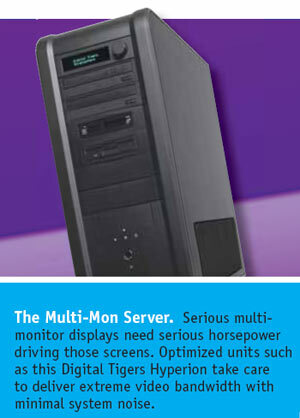 © 2006 Reseller Advocate magazine.